Question: My buddies and I are always arguing about how long a given fish is, which means we have to break out the measuring tape. I would rather get fish back in the water as quickly as possible. What’s the best way to get a fast measurement, while keeping the fish in the water? Answer: This is an important issue because the amount of time you keep a fish out of the water is crucial. As Charlie Meyers noted in the Denver Post on June 10, studies by the Colorado Division of Wildlife show that leaving the fish in the water while you unhook it can double its chances of survival. So what you need is a way to get a nearly instantaneous measurement on the fish you catch. When I was a guide, I futzed around with several methods, until I finally settled on what I thought was the quickest and easiest: I measured my own forearm, from the point of my elbow to the tip of my middle finger. The total distance is just under 19 inches. From the elbow to the bump in my wrist is 10 inches, to the base of my pinky is 15 inches, and to the end of my pinky 17 inches. I easily memorized these numbers and could make a very educated guess for an inch or two to either side of these points. To accurately measure your arm, put your elbow against a wall, and then put the end of a tape measure against the wall. Knowing the distance from elbow to wrist to fingertips gives you a permanent “yardstick” for fish length. Rachel Barlow photo. Whenever I landed a fish for a client, I could hold the fish just under the surface, lay my forearm alongside it, and get an immediate rough measurement. Sure, it wasn’t exact—and, as a guide, I may have rounded up on occasion—but this method lets you know immediately whether a fish is closer to 15 inches than it is to 18. Anything over 19 inches, of course, is a little more complicated. In this case, I’d mark the 19-inch spot, slide my hand to the fish’s nose, and do the estimate in reverse. Simply add the two numbers and you’re good to go. 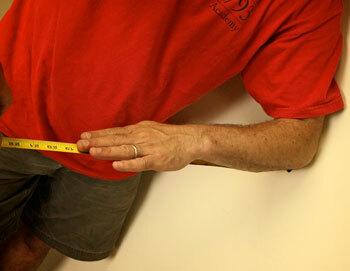 (Example: tail forward to mark = 19 inches, nose back to mark = tip of middle finger to base of pinky, or 4 inches. 19 + 4 = 23-inch fish.) Anything over, say 25-inches and, face it, you’re breaking out the damned tape. What I particularly like about this method is that you don’t have to worry about holding anything but the fish. However, many anglers like to use their rod as a measuring stick. Jay “Fishy” Fullum, a well-known fly tier and angler, recommends using thread wraps on your rod blank. He makes narrow wraps at 12, 14, 16, 18, and 20 inches. You can use easy-to-read hi vis colors, or, if you think that ruins the aesthetics of your rod, you can use colors to match the guide wraps. When you want to measure a fish, simply lay the rod alongside the fish in the water and estimate based on your wraps. Both of these methods require a lot less fumbling through pockets or arranging stuff on your vest, saving valuable seconds separating the time you land the fish and the time you let it swim away. And if your buddies can’t live without an absolutely, scientifically verifiable measurement, just get new buddies. It’s better for the fish that way.